Cort, Cornelis (Hoorn 1533 – Rome 1578). St. Onuphrius with the rosary in a landscape. In large rocky wooded landscape front right the long-haired + long-bearded saint dressed with loincloth and shawl with the rosary dangling from his left – as everything typical for him, though here not marked by emaciation – communing with Christ crucified. Laid down beside him folio and smaller book. The small crucifix fixed to a stump. On the left small cascade. 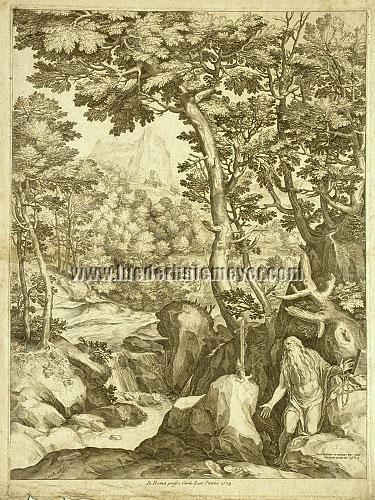 Engraving with etching after Girolamo Muziano (Acquafredda near Brescia 1528/32 – Rome 1592). Inscribed: in the subject lower left Corneli cort fe. + right PRIVILEGIO.D.GREG.PP..XIII / Hieronimo mvcian.inu. 1574 + in the lower platemark In Roma presso Carlo Losi l’anno 1774. 20⅜ × 15⅛ in (51.8 × 38.3 cm). From Wurzbach Cort 33; Nagler III, p. 126, and, Muziano, X, p. 87; AKL XXI, pp. 341 f.
(AKL 1999), here then in Losi’s evenly fine impression to whom are owed from the 1770s yet further new editions of the 16th century, with invariably fine differentiated setting off of the heroic landscape staggered into the depth. – On strong laid paper with twice enclosed watermark Fleur-de-lis in circle with letter pendants, related to the extensive group Heawood 1589 ff. as throughout Italian papers of the 16th to late 18th centuries. – Margins on three sides 2-2.5 cm wide, below only 5 mm and here on the left up into the wide white platemark somewhat age-creased with acid-freely backed tiny(est) tears. Free of tears, but slightly creased also the right half of the wide white upper margin. – Smoothed centerfold with from front only feebly perceptible brown trace outer left. Otherwise foxspottedness on the back and on the front in the left white margin. In such a manner of positively still fine general impression as frequently searched for in vain with these large formats of old prints, furthermore standing for Cort’s fame beginning with the arrival 1565 at Tizian’s in Venice. created his works exemplary for a whole generation of engravers . The sudden turn to the grandiose in the style of C.
the new epoch of the Italian engraving induced in the following by C.
which other praised artists of his time lack ”. to have opened “ the way of the art of engraving in the large scale ” . with an interesting rarer Father of the Church uniting both Roman + Eastern Catholic Churches as fine setting. With June 12 as his commemoration in both churches. by papal Motu proprio privileges for the distribution of individual sheets ”. His Saint Hubert also available here did not receive this favor. – For the Onuphrius details credits go to Wikipedia + Encyclopedia Britannica.